What Analytic Software are People Discussing? How can we measure the popularity or market share of analytic software? One way is to see what people are discussing. 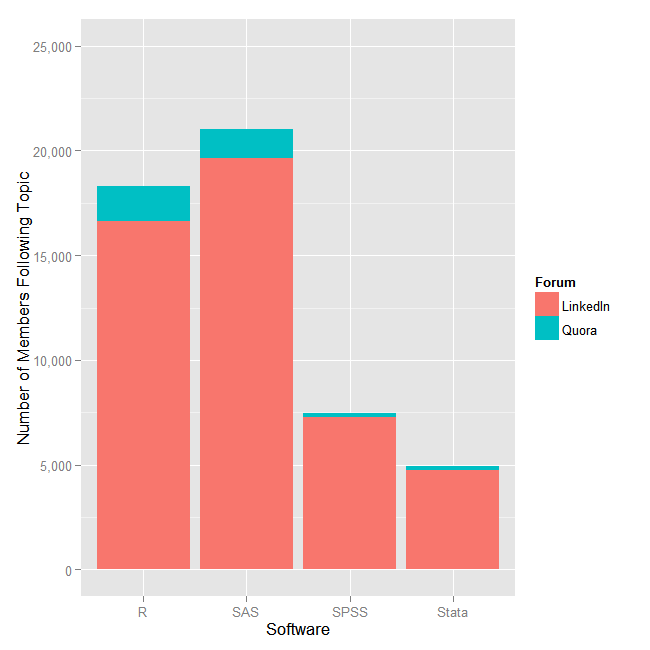 I’m in the process of updating my annual article, The Popularity of Data Analysis Software. Below is the newly updated Internet Discussion section. Don’t bother to read the rest of the main article unless you’re in a hurry. I’ve been collecting data for several of the other more interesting plots and will have more to report in following posts. As always, I’m very interested in getting feedback. If you know of other discussion forums that I can collect data on without too much effort, please let me know. Internet Discussion There are some stable and objective measures regarding analytic software. Schwartz (2009) suggested estimating relative popularity by plotting the amount of email discussion devoted to each. The most widely used packages all have discussion lists, or “listservs” devoted to them. The less popular ones either do not have such discussions or, like the lists for Minitab or S-PLUS, may have only a dozen or so emails per year. Some software packages have multiple discussion lists. For example, there are 21 devoted to using R for various focused areas such as graphics, mapping, ecology, epidemiology, etc. (https://www.r-project.org/mail.html). A broader list, including a version of R-Help in Spanish, lists 49 discussions (https://stat.ethz.ch/mailman/listinfo). Figure 1a shows the level of activity on only each main discussion listserv in a typical month (i.e. forums, news groups and Google groups are excluded). Each point represents the sum of the 12 monthly counts that occurred in that year. This plot contains data through the end of 2012. If you read this article in previous years, this plot used to display the mean number of emails per month rather than the sum. Therefore the scale of the y-axis is different but the relative locations of the points are virtually identical. I made this change to enable better a better comparison to discussion forums (e.g. Fig. 1b). Figure 1a. Sum of monthly email traffic on each software’s main listserv discussion list. We can see that discussion of R has grown the most rapidly and, for the past few years, R is the most discussed software by an almost two-to-one margin. In recent years, it is followed by Stata, SAS and SPSS, respectively. Stata showed steady discussion growth until it passed SAS in 2010. SAS saw rapid growth in its discussion until 2006 when it leveled off and then declined. That decline coincided with the strong growth of both R and Stata, offering competition to SAS. SPSS held steady at a low rate across the time frame, which may be attributable to its great ease of use relative to the other packages. With both the interface and the documentation aimed at people who prefer GUIs over programming, there’s less need to ask how to do variations on an analysis. In fact, there’s less ability to do such variations. As a result, I doubt SPSS’ low showing in this graph is indicative of its popularity or market share. It would be interesting to see what topics were most discussed on each list. The only such analysis of which I am aware was done by Arthur Tabachnek (2010) for the SAS list. The most popular topic in 2009 turned out to be…R! You can read his full analysis here under slides from the 2010 session. 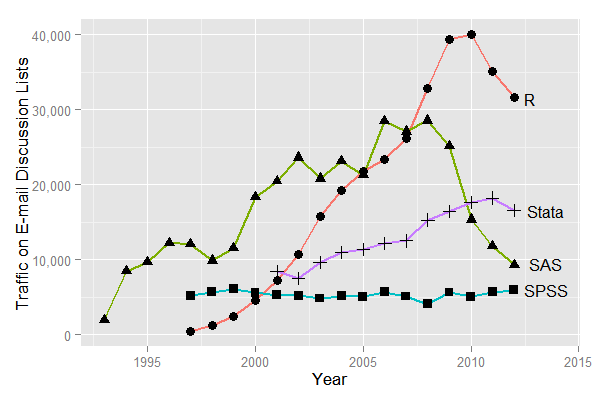 In the last year or two, R and Stata joined SAS in the decline in listserv discussion. Given the sharp increase in the popularity of business analytics, Big Data, and so on, it is unlikely that people are using or talking about these tools less. Instead, alternative forums of discussion have appeared. The site Stack Overflow (http://stackoverflow.com) covers a wide range of programming and statistical topics, while its sister site, Cross Validated (http://stats.stackexchange.com/), focuses only on statistical analysis. A third site, Talk Stats (http://www.talkstats.com), also focuses on statistical analysis. At all three sites, users tag their topics making it particularly easy to focus searches. Figure 1b shows the software people are discussing there. Figure 1b. Number of posts per software on each forum on 2/10/2013. We can see that the discussion of R is dramatically higher than the other packages, which don’t differ very much. Much of this difference is due to the influence of Stack Overflow, reflecting the vastly greater popularity of R as a programming language. However, even removing that effect, it is easy to see that R still dominates the discussions on the more statistically-oriented forums. This data is cumulative, but it would be very interesting to see how it grew by year. Without access to such data, at least we have the data in Fig. 1a to give us a feel for history. Other popular discussion forum sites are LinkedIn.com and Quora.com. Neither of these sites make it easy to count number of posts, but they do display the number of people who have joined discussion groups (Figure 1c). Figure 1c. Number of people registered in the main discussion group for each software. 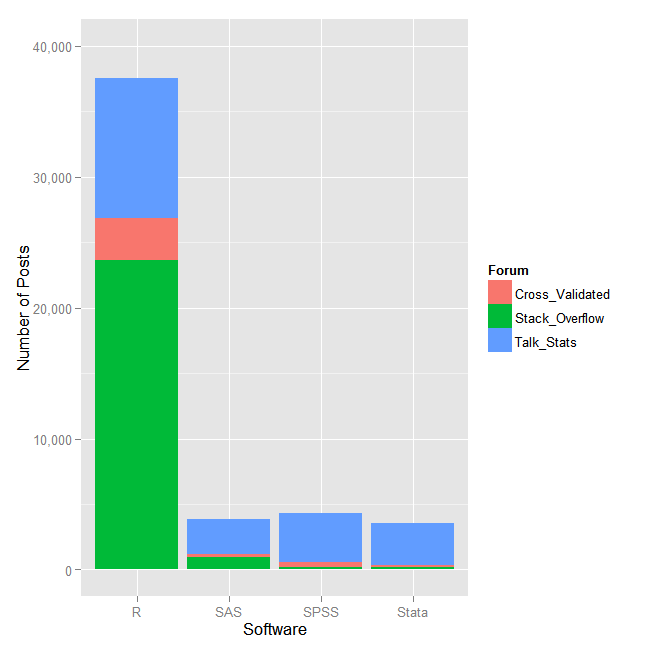 In Figure 1c we get a better view of corporate software use. I do not know the ratio of corporate to academic use of LinkedIn, but among the academics I do know (quiet a few) they use it very little. In this world, SAS is the leader with R close behind. It’s interesting to see SPSS with a 50% lead over Stata; it was also slightly higher in Fig. 1b. Remember these are people who have joined a group, not necessary people who are talking as the previous two figures were. Still, group membership should be a reasonable proxy for popularity or market share. In the coming weeks, I’ll be updating the data on which software scholars are using, the growth of R packages and what skills employers are seeking in their new hires.